Provides three accessories shoes hosting a maximum 3 accessories. Industrial standard shoe size supports accessories such as camera light, external microphone, wireless mic receiver and so on. 6" (width) x 5.5" (height) x 1"
The inner measurement from the tip of the 1/4-20" screw to the top piece is about 4.75"
The 1/4-20" screw can be slided left and right for different camera positioning. From the tip to the side grib, the distance can be 2.5" to 4.5"
Posted by fritz on 7/1/2009 2:56:00 PM Does this unit allow the monitor door on a Canon HF S100 to open all the way on the left side? Replied by LA Color Pros We have not tried it on HF S100. But with HV20 and HV30, they can open all the way without any problem. Actually, the mounting screw at the bottom has a rail that you can mouse at different position. So it should work with HF S100. Posted by GUEST on 7/3/2009 8:43:00 PM Can this still be mount on a tripod, and is this in stock? Replied by LA Color Pros Yes, the flash bracket can be mounted on any tripod. i have sended couple days ago a email within a question. Is this product still on sale if so do you people ship it even to the netherlands (europe)? im very interested in this product! i just recieved yesterday by postman this flashbracket, thanks for sending! its great tool! Replied by LA Color Pros Michael, glad you received the item and work great for you. Thank you for shopping with us. Posted by Ken on 8/5/2009 1:58:00 AM Ideally, I would want the bracket on my right side when holding the cam. I've seen some brackets on the right side before (w/ VL-10s pointing in the right direction). But this bracket looks decent! As long as the LCD on my HV30 can open and close without taking off the bracket then I'll be happy. Replied by LA Color Pros Ken, the bracket is very flexible. It can be mounted on the left or right side of the camera. If you mount it on the right side, your LCD can fully open without problem. Posted by Ken on 8/15/2009 6:32:00 PM Works great with the Comer LED light! Slides right in front or backwards meaning I can mount it on the left or right side. Much more flexible than the Canon VL-10. Great bracket! Posted by Jill on 9/14/2009 10:46:00 PM I recently purchased this bracket and I was wondering if there was a way to make it more secure? I screwed it on to the bottom of the HV20, but it still slides and moves around. I feel like I'm not doing something right here. Replied by LA Color Pros You can try using a wrench to tighten it. Posted by tony on 10/31/2009 7:47:00 PM Would this work with my hf s 100 and the juiced link atttached to it? Replied by LA Color Pros It works with any camcorder with the standard tripod mount with 1/4" thread size. So if you can mount your HFS100 on any tripod, you can use this flash bracket. Posted by Logan on 11/22/2009 1:30:00 PM will this also work well as a handle? Replied by LA Color Pros Yes it can be used as a handle. As you can see from the picture there is a hand grib on the side. Posted by may on 11/30/2009 7:37:00 PM what are the dimensions and how much does the bracket weigh? what is it made off? Replied by LA Color Pros It is made with metal, very sturdy. Weighted 6.2oz. Dimension of the three sides are approximately 6" x 5" x 4". Posted by may on 12/1/2009 4:04:00 AM which metal is it made of? i love the design, but i am concerned about corrosion (if it were aluminum, for instance, there would be no concern). another important question: with HV20/30 - is there room for my hand to hold the handle when the LCD is open? Replied by LA Color Pros Hi May, I do not know what kind of metal it is made of. The bracket is well made so corrosion would not be a concern. You can also mount the bracket handle either to the left or to the right of the camera to fit your needs. It won't block the LCD screen and you still be able to hold the handle with the LCD opened. Posted by JSRAIMUNDI on 12/18/2009 1:40:00 AM Can i put mi 7" Monitor in this? Shipping to Spain? Thanks!! Replied by LA Color Pros The bracket is made with solid metal and made for holding any accessory with standard accessory cold shoe. We do ship to Spain. Posted by Justin Tierney on 1/4/2010 10:04:00 PM I just want to start that I usually don't email a company for its customer service. In your case I would make an exception. I placed my order on Friday night at 10 PM for a Flash Bracket with 3 Accessory Shoes. I got it today in the mail at 11 AM. You are based in LA and I am in NY. A country across and still managed to get it here over the weekend. You must have shipped it out Saturday morning. I usually expect packages on a Thursday when placed on a weekend. The confirmation email was FAST, the handling and shipping it came in was great! and the product is amazing! Just what I needed and great quality! I will be more than happy to do business with you in the future. Thank you again, and I will be recommending you to all of my video friends. Posted by scott on 1/15/2010 11:20:00 PM I have been using this bracket for sometime now and it works well BUT when attached to the HV30 and then attach it to a tripod I use the bogen 501 HDV it still has some give between the bracket and tripod mount. It slides, and it has nothing to do with screwing it tighter that has been tried. It seems that having the plastic to plastic screw being two smooth surfaces allowing for some movement. would you put a small washer between the bracket and the camera and again between the bracket and the tripod attachment. So when panning the actual HV30 ends up rotating where the bracket screws into. Replied by LA Color Pros Scott, I'm not so sure what's your situation is. From how I use this bracket with a small camera like HV30, I mounted the camera onto this bracket, then mount the bracket to the quick release plate. When mounting to the quick release plate, I mounted it 180 degree opposit to where the direction should be (so the camera face backward). After mounting the quick release back to the tripod, I turn the whole bracket 180 degree back to the front. Then tighten the whole rig really good. Posted by ali on 3/2/2010 4:21:00 PM how much does it weigh? Posted by Matty on 3/6/2010 3:48:00 AM Is it possible to use this bracket to mount the camera upside down for use with a 35m adapter setup so that you can shoot without having to flip the image in post? If you can take out the knob that screws into the camera and flip it over to use on the other side, it could be really nice and versatile as an alternative for shooting with the camera upside down and have accessory shoes or monitor mounting points above the camera. Otherwise, the accessories must hang below the rig which is not always preferable. Thanks for you help! Replied by LA Color Pros The knob cannot be removed from the bracket. However, you can just hold the bracket up side down for the same purpose. Posted by Microwave Kane on 4/26/2010 3:00:00 PM Does this one have the female tripod screw on the bottom of the knob like the single shoe version does? Replied by LA Color Pros Yes it does. The bottom looks the same as the one shoe flash bracket. Posted by Randy on 4/27/2010 11:27:00 PM I've got a similar bracket but the shoe mounts came off since they are not screwed into the bracket and just glued on. There are 3 prongs to fit the shoe adapter onto the bracket but they don't help it stay on the bracket once the glue seal is broken How are the 3 shoe mounts attached to this bracket? Replied by LA Color Pros Randy, the three shoes are mounted on the metal bracket using 3 metal screws each. They are not glued. Very sturdy. Posted by Andres Castro on 5/6/2010 12:55:00 PM Hi , I was trying to buy something before 12 so m order ships today :(, but my paypal country is in Mexico, although my shipping address is in the U.S. in Texas. Could you sent me an invoice to my mail for 46 Dollars , to pay asap, since im leaving next thursday i really need to order as soon as possible. Posted by Sanjay on 5/31/2010 4:14:00 AM Hi, I also have the HF S100 microphone (DM-100) attached so could I use this bracket to put a Comer 900 light am looking at purchasing and still leave the DM-100 microphone on?..Would the clearance be enough i.e no obstruction to the bracket? Posted by Sanjay on 6/2/2010 2:51:00 AM Hi, can this bracket be easily hand held when attached to my Canon hf-S10 camorder and teh Comer 900 light am looking at getting? Can it also be attached to a tripod if required? Replied by LA Color Pros This bracket has a handle on the side so you can hand hold it easily. The bottom can also be attached to tripod quick release plate for easy mounting. Posted by Sanjay on 6/2/2010 2:53:00 AM Also can I see pictures of this bracket in use?. just came looking for this item for my HV40 and see it's now out-of-stock! :( Any idea when you'll be getting some in? Replied by LA Color Pros Hi DebG, this bracket is not easy to find. Some of them are imported. You can click on the "Notify Me" link on the page so you will be notified when the bracket is back in stock. Posted by Chris on 1/25/2011 4:00:00 AM Hi, can you please give me the internal dimensions beween the inside top and bottom of the bracket so I know the maximum usable area. Thanks. Posted by Paul on 2/27/2011 12:02:00 AM Is there a simple way to attatch a base to this so you can rest the camera down on a flat surface if not using a tripod. Replied by LA Color Pros This flash bracket is meant to be used handheld or mount on tripod. With the tripod quick release attached to the bottom ring of the flash bracket, it can be stand on it's own. Of course you have to find out if your tripod quick release has a flat surface. Or you can in fact, use the two items you suggested to create an instant stand. The bottom of the Flash Bracket has the 1/4-20" thread hole. So the TZ1 Stud connector can goes into it. The base for the stud connector can be mounted on the Accessory Shoe Desktop Stand. Bingo! Does this bracket attach to a Juiced Link CX231? I have an HV20 and will be purchasing this adapter soon. Replied by LA Color Pros Yes the Juiced Link can be attached to this Bracket. I LOVE this bracket and want to buy another one for my Canon HF G30, but when I've tried it out on this camcorder it's just a bit too small to flip the LCD screen out. Is there anything you have like this bracket/handle that could work for the G30? Replied by LA Color Pros Hey Deb, that's the only bracket we have. I have used it on Canon XHA1, HV30, and DSLR with flip screen. All works. But not sure about your HF G30. Host more than one attachment to camera standard accessory shoe. 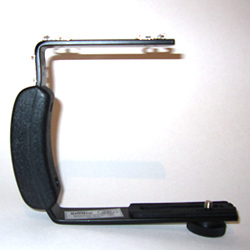 Standard accessory shoe size bracket for video lights and microphone.